Yu-Gi-Oh! BAM was a web-based game, playable through Facebook or Kongregate. Frima Studio were contracted by Konami to develop the game; Konami, however, maintains publishing rights.. The game closed on September 30, 2014, but still existed as the mobile game Yu-Gi-Oh! 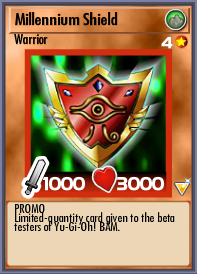 BAM Pocket until September 9, 2016, when the servers were shut down. Favicons used from earliest to latest. The game is set in Alba Litora. After completing the main story, the setting is moved to Tropica City. Acid Jet Once per Round, when this Monster loses Power, your Opponent loses Life Points. Annihilate Destroy your Opponent's Monsters/Spells. Backfire You lose Life Points. Big Explosion When destroyed, all monsters on the Field are destroyed. Both players lose Life Points. Bloodlust Your Opponent loses Life Points the first time your Opponent loses Life Points. Boost Your Monster gains Power. Courage Gains Power if it is the only Monster of your side. Cripple Your Opponent's Monster loses Power. Destroy Destroy your Opponent's Monster/Spell. Drain Gains Power when Opponent loses Life Points. Empathy Loses/Gains Power as you lose/gain Life Points. Explosion When destroyed, facing Monster is also destroyed. Both Players lose Life Points. Farewell You gain Life Points when this Monster is destroyed. Feeble Loses Power every round. First Strike At round start, if your Graveyard is empty, you opponent loses Life Points. Fragile Destroyed after battling another Monster. Growth At Round End, your Monster's Power doubles. Heal Opponent Opponent gains Life Points. Immune Your Monster cannot lose Power or be destroyed. Last Stand Doubles its power if there are no cards in your Deck at Round Start. Mirror Every Round, the first time you lose Life Points, your Opponent loses Life Points. Necro [Other effects]. This effect increases with each Card in your Graveyard. Osmosis Drain Power from your Opponent's Monster to yours. Parting Gift Opponent loses Life Points when this Monster is destroyed. Power Redistribution When this Monster is destroyed, all your Monsters in play gain Power. Rage Gains Power when you lose Life Points. Requiem Opponent's Monsters lose Power when this Monster is destroyed. Resurrect One random Monster/Spell from your Graveyard is shuffled into your Deck. Self-Destruct Destroyed at the end of the round. Shared Fate When destroyed, your Opponent's Monster is also destroyed. Sneak Destroy Opponent's Monster before it attacks. Sorrow You lose Life Points when this Monster is destroyed. Spirit Protection When your Monster is destroyed, all your other Monsters gain Immunity. Timidity Loses Power if your Opponent has two or more Monsters in play. ↑ "Yu-Gi-Oh! BAM (Facebook)". Frima Studio. ↑ "Yu-Gi-Oh! BAM - Konami Digital Entertainment's Online Game". UR Game Tips. ↑ "Yu-Gi-Oh! BAM (Kongregate)". Konamikg. This page was last edited on 18 May 2017, at 15:49.